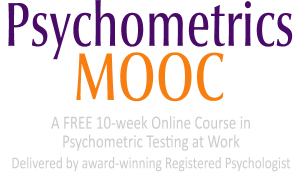 In Module 7 of our 10-week, Free Online Psychometric Testing Course, we look at Scoring of Psychometric Tests. Nowadays, the majority of psychometric test scoring is carried out by computer. This reduces the potential for error that we may see with hand-scoring. However, once we know the candidate’s score, we need to know how to use that score, how to obtain meaning from it, and how to transform it to other types of scoring systems. We will focus on these issues in this Module. Module 7 will be released on 18 November, 2015 to those registered for our Free Psychometrics MOOC. Below is a longer outline of what is to be covered. Now that we can administer psychometric tests professionally (Module 6), we move on in this Module to consider the next logical step, which is the scoring of psychometric tests. This Module will teach you about different ways of using test scores and the different standardized scores that are available. In addition, you will learn about how to select appropriate norm groups. We also offer a demonstration of hand scoring, but the objective behind this is not to teach you how to score psychometric tests by hand, rather, to help you see the many ways in which hand-scoring can negatively impact reliability. We therefore hope you will avoid it! By the end of this Module, Learners will understand various standardized score systems and know how to transform between them. – Know the difference between criterion-referencing and norm-referencing. – Understand the factors involved in choosing and using appropriate norm groups. – Know some of the pros and cons of multiple standardized score scales. – Know how to convert a candidate’s raw score to a percentile score with ease. – Know how to convert between different standardized score scales with ease. – Understand the multiple potential areas for error in hand scoring of psychometric tests. Join Learners from all over the world and network/interact with them and our facilitator in our Learner Forums, Discussions and Live Sessions between 7 October and the end of December, 2015.